In the months leading up to my move to France, multiple people informed me that I would soon become a bread snob. I mostly laughed these sentiments off, because due to my spectacular lack of cooking skills, my standards for food are incredibly low. Basically, if it’s edible, it’s better than what I could make for myself, and therefore I’m a happy camper. I was, however, looking forward to having some proper French baguettes, because given all the hype, I assumed they would be awesome. I also assumed that all baguettes in France taste the same, and while I was correct on the former, it turns out I was so very wrong about the later. Bread is big business in France. There are more than 35,000 bakeries in this country, which works out to approximately one bakery per 1,900 people. Over 32 million baguettes are consumed every day in France, and that’s not counting the daily tally of croissants, macarons, chaussons aux pommes, and my personal favourite, the pain au chocolat (chocolate croissant). At this point, I estimate that I’m personally responsible for eating about half of the daily pain au chocolats consumed in Paris every day. While eating a baguette should be on every visitor’s to do list, most people don’t realize that there are different kinds of baguettes from which to choose. 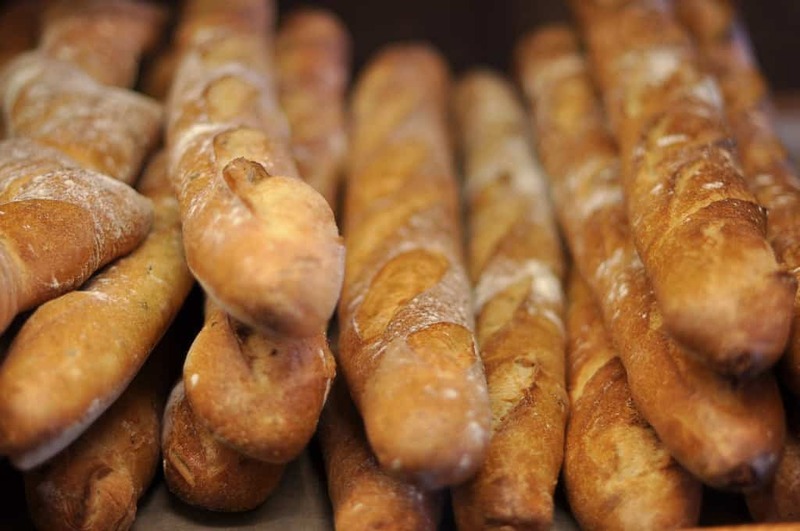 By French law, baguettes can only be made with four ingredients: flour, water, salt, and yeast. The price of a baguette is also closely regulated, meaning they will often cost you less than a Euro. However, because of this, some French bakers will only use the cheap ingredients in their regular baguettes in order to keep costs down. Therefore, if you want to experience a true French baguette you have to ask for “une baguette tradition”, or “une tradition” if you want to feel like a local. Traditions are slightly more expensive than your classic baguette, but they’re made with the good stuff, meaning the quality is infinitely better. If you want to find one of these delicious loafs, all you have to do is look for a sign for a boulangerie. Under French law, establishments are only allowed to market themselves as such if their bread is hand kneaded and baked on premise, meaning you don’t have to worry about getting cheap frozen knockoffs. Just find the closest boulangerie, ask for a baguette tradition, and enjoy your time in bread heaven. As for myself, I currently have six boulangeries within a five minute walking radius of my apartment. I’ve tried them all and I now know which one produces the best baguette in order from one to six. I also know which one produces the best pain au chocolat in order from one to six, and annoyingly those two lists are not the same. Each boulangerie is also closed once a week on staggered days, so depending on the day and what I want, there are times when I’m going to a different bakery every day. I suppose this means I have indeed become a bread snob, but when I’m walking home with a fresh-from-the-oven tradition in hand, I’m completely okay with that.